Product prices and availability are accurate as of 2019-04-04 23:08:39 EDT and are subject to change. Any price and availability information displayed on http://www.amazon.com/ at the time of purchase will apply to the purchase of this product. 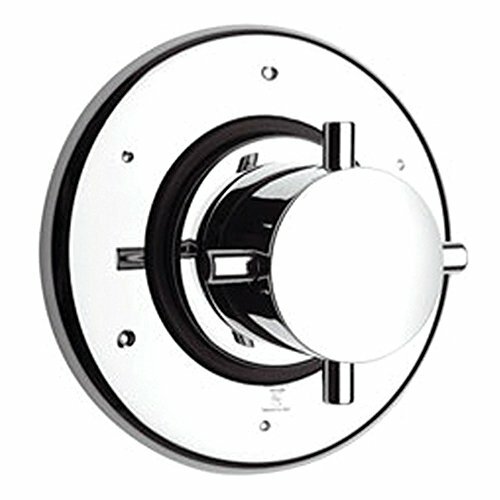 Complete your new bathroom faucet fixture with the La Toscana Water Harmony USCR425 Three Way Diverter Valve Trim. This convenient handle lets you combine and control up to three water spouts from one location. A ceramic disc valve cartridge is included to prevent the assembly from developing leaks and drips. The knob lets you easily control which water-source is serviced. The entire piece is made from solid brass and comes protected by a beautiful polished chrome finish to prevent scratches and water-damage (such as tarnish, corrosion, and rust). The unit installs easily with most standard US plumbing hardware. About La Toscana by Paini La Toscana creates faucets, bath vanities, and accessories in a wide range of styles. From elegant and traditional to sleek and modern, they have a kitchen or lavatory set-up perfect for you. La Toscana products are made by Paini. Paini was started in Italy in 1954 as a small craft-made factory that produced quality fixtures and faucets. Still today Paini prides itself on transforming highly quality raw materials into luxurious fixtures and faucets, all in conformity with strict international regulations. Constructed from durable solid brass. Ceramic disc valve included. Dual-handle design for accurate control. Protected with a chrome finish. Dimensions: 8L x 5.5W x 4H inches.